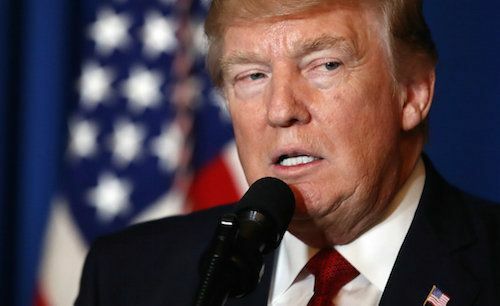 Some of Donald Trump's most fervent supporters were taken aback when he fired more than 50 missiles at a Syrian airfield, after the Syrian government reportedly used chemical weapons to kill more than 70 civilians in the Syrian town of Khan Sheikhun. The 'alt-right '- a group of ethnonationalist, isolationist ultra-conservatives - criticised the move with the same derision they expressed for the president's failed healthcare plan. "Trump had zero right to do what he did," wrote one commenter on Breitbart, an online hub for the alt-right. "He attacked a sovereign country without provocation and without congressional approval for war. Four months in and I am really close to zero faith in him." "Trump has some explaining to do. This isn't what I voted for," wrote another. "This one act has proven to many of us that Trump betrayed all of us who voted for him," added a third. Others offered a range of excuses: Trump's top officials are leading him astray; he was tricked and there were no chemical weapons; it's all part of a secret master plan; and that Trump campaigned on waging war with ISIS. Leading alt-right figures and their followers expressed similar doubts, fears and justifications in the darker corners of 4chan and Reddit. But along with the usual conspiracies and calls for solidarity, there were several important questions raised about the strike that could have come from a New York Times or CNN report. Besides the issue of sovereignty, commenters asked whether the US should continue policing the world and wading into overseas conflicts. Others argued America has a moral obligation to prevent children being gassed, wherever they reside. And other Breitbart readers queried what Trump's endgame would be, pointing out that removing Syrian President Bashar al-Assad would leave a war-torn, ungoverned nation and a power void with no obvious occupant. There's an old saying that if one goes far enough to the right, they end up on the left. This was showcased during the campaign, as die-hard liberal Bernie Sanders and Donald Trump both criticised current trade deals and called for protectionism. It's possible liberal spies have infiltrated Breitbart's comments section to divide its readers, but the more likely diagnosis is that racist and xenophobic white nationalists, keen to make a case against foreign intervention, are marshalling mainstream, liberal and humanitarian arguments. The alt-right supported Trump largely due to his rallying cry of 'America First' and promise to 'Make America Great Again'. However, their enthusiasm for a revitalised nation only extends to more jobs and wealth creation, not displacing foreign dictators or accepting refugees. The president's sudden passion for combating evil and saving innocent lives has been an unwelcome surprise for them. For progressives, it's heartening to see the alt-right - many of whom espouse anti-Semitic and Islamophobic views - adopting mainstream arguments and cautioning against thoughtless violence. Their disappointment with the Trump administration could also cause further rifts in an already divided Republican party, paving the way for a Democratic resurgence. Rather than crippling Assad's forces, Trump's missiles have arguably blown up in his face by alienating some of his most rabid supporters and creating further uncertainty.